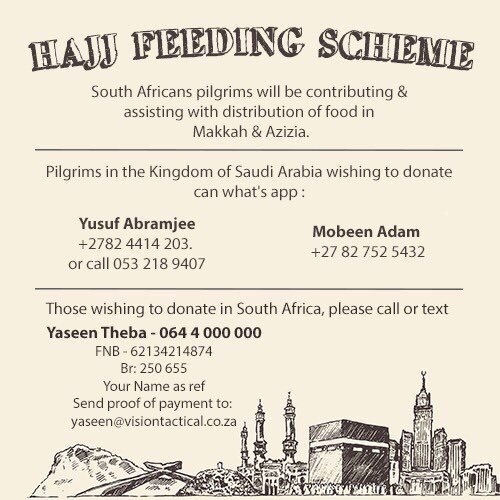 Over R250 000 has been raised by South Africans to assist destitute pilgrims in Makkah Saudi Arabia ahead of the annual Hajj.A collection drive spearheaded by social activist, Yusuf Abramjee, who is on his first Hajj, saw many of the 1950 South African pilgrims in the Kingdom and scores of locals donating to feed hungry pilgrims from various parts of the world. “Hundreds of pilgrims in Makkah simply sleep along streets and outside the Grand Mosque. A few of us decided to do something and within minutes we raised R70 000 amongst SA pilgrims. “Back home the message fast spread on social media and we raised a further R180 000. Cash is still coming in for the feeding schemes,” Abramjee said. After Friday prayers, the South Africans distributed over 400 food packs and some 1000 bottles of water. “Within minutes it was all gone. Pilgrims lined up for the food and water. We are making a small difference…And in true South African tradition, we are again opening our hearts,” Abramjee added. The group was planning to feed a further 500 pilgrims on Sunday evening near the Grand Mosque. Abramjee said pilgrims in Azzizia outside Makkah will be fed next week and thousands of bottles of water would be distributed during the 5 days of Hajj which starts next Saturday. “Charity is part of our religion and we are doing our bit to make a difference. We are keeping the SA spirit of Ubuntu alive here,” Abramjee said. Abramjee, a social cohesion advocate was involved in the launch of Operation Hydrate earlier this year. Volunteers distributed millions of liters of water to drought-stricken parts of South Africa. Abramjee said the food was being distributed to pilgrims from across the globe including Nigeria, Ghana, Egypt, India, Pakistan and Bangladesh.